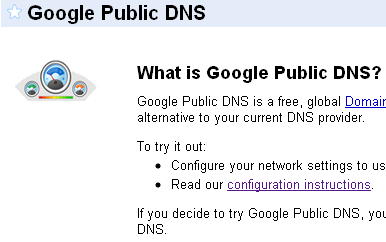 Google has just launched its Google Public DNS service, freely available for you to use. Another free Google service, yaay! DNS is something that ideally, you wouldn’t even know what it meant. Actually, it stands for Domain Name System, and is the system of computers and registries around the world that convert your delightfully easy to remember www.vishalkumar.in or www.orkut.com to get to your website. What happens in the background is that your computer asks the DNS on which server www.vishalkumar.in is being hosted, and then downloads the data from that server. And you didn’t have to memorize the IP address (a delightful number like 74.125.45.100 (which incidentally, is Google’s homepage), and can surf the net that much easier. The benefit will be apparent when you start browsing, as things will start moving faster, with the site and images and content loading faster (especially on sites where content is pulled from other sites). Overall, switching to Google Public DNS is a good idea, and unlike some ISP’s DNS servers, you don’t get pulled into an ad filled search page if your site is wrong, saving on bandwidth too. 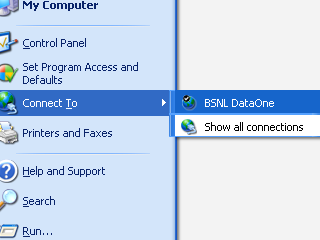 Here’s a screenshot filled tutorial on how to set it up with your BSNL Router, or normal connection. 1. 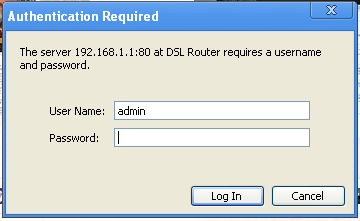 Login into your router. This is done by typing 192.168.1.1 in your browser. You should see this. Click on Advanced Setup. 4. 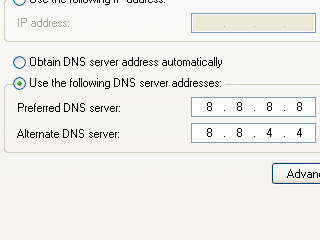 Click on DNS. You’ll see the following. 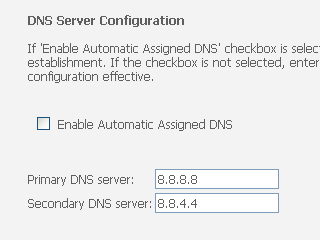 Uncheck the Automatic Assigned DNS, and type in the values 8.8.8.8 and 8.8.4.4 in the given place. 5. Click on Save. Thats it you’re done. 1. Go into your connections. 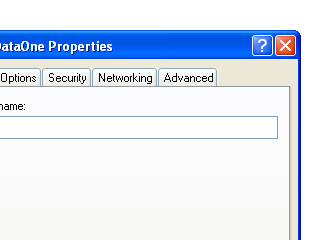 Either its in Show All Connections in XP, or Network Connections, in your Network and Sharing center. 2. You should have something like this. I have my Broadband connection here. You should be disconnected to update any settings, so disconnect now, if you have to. 3. 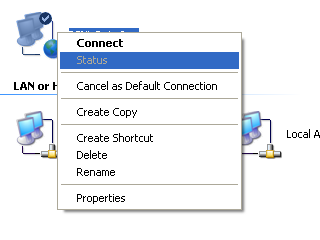 Right click on it, and click on Properties. 4. Check the tabs. Click on Networking. 5. 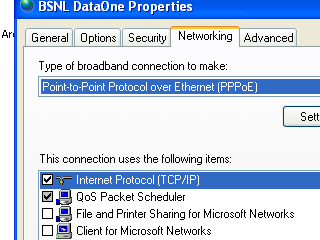 Select Internet Protocol (TCP/IP), and click on properties on the left side. 7. Click a bunch of OK’s, and reconnect. You should be whizzing while surfing now. In conclusion, Google Public DNS appears to be very useful for people around the world (DNS servers within the U.S. are fast enough). Google doesn’t serve any ads on failed sites, so you don’t end up wasting bandwidth. You may also be wondering why Google is giving this service for free. Google has a lot to gain from the overall statistics. That said, Google won’t record anything personally identifying. 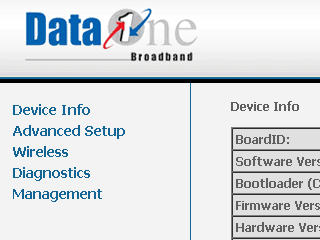 (Your IP address will be in the buffer for 24-48 hours to address individual problems). But Google would get a lot of insight into how various websites around the world are being accessed. Also, Google’s primary field is online applications, many of which depend on connections being as fast as possible. If Google improves on this aspect of web surfing, it will also improve the accessability of its own services too. The Google Public DNS shows improvement of anywhere from 30 to 50% (from ~250ms to ~110ms), compared to its competitors (one of which would be your default ISP’s). Anyway, check it out, and let me know what you think. 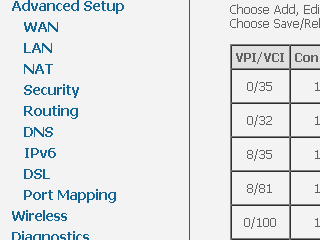 Google DNS is not the fastest for me. I ran the same test suggested and here are the results. 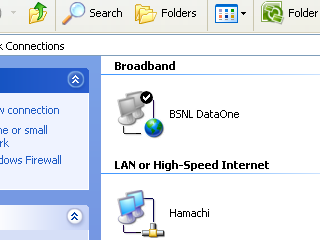 I'm using BSNL's DNS server and in this case BSNL seems to be the fastest.